Aussie retirees have a love affair with shares, but not all share portfolios are created equal when it comes to providing sustainable income. This article focusses on the four things that pension-phase investors need to consider when investing in equities: tax, income, growth and regulations. One failure of the Australian investment industry is that franking is largely invisible, with investment returns conventionally reported pre-tax, excluding franking. For a pension-phase investor, the difference is significant. Chart 1 highlights the tax differences between pension, super and the highest individual tax rate. For the pension investor, $1 of pre-tax capital gain (short or long term) or unfranked income (interest, rental, overseas dividend, unfranked dividend) is worth $1. However, $1 of fully franked dividend is worth $1.43 since the pension investor gets a $0.43 franking credit refund. Franked dividends are also worth the most for super investors at $1.21, with long-term capital gains worth $0.90 whilst the other two returns are worth $0.85. Retirees have different needs to accumulation phase investors. They need income to live off, are likely to be less risk tolerant than working investors, and their pension income is tax free. This should be reflected in both the design of retirement-phase products, and in the way they’re measured. Generally, income returns are calculated without regard to tax or franking credits, while observations that Australian shares have suffered from a ‘lost decade’ of poor returns don’t give sufficient credence to the income generated. On its own, price growth of Australian shares is underwhelming. 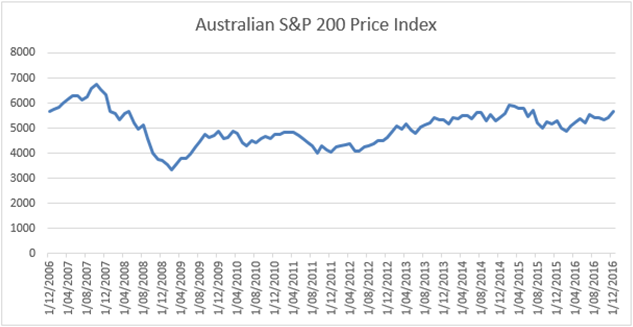 Over the 10 years to the end of 2016, the ASX/S&P200 price index has tracked predominantly sideways, as highlighted in Chart 2. In price terms, it still hasn’t returned to its pre-GFC highs recorded on 1 November 2007. But equity investing is not all about capital growth. 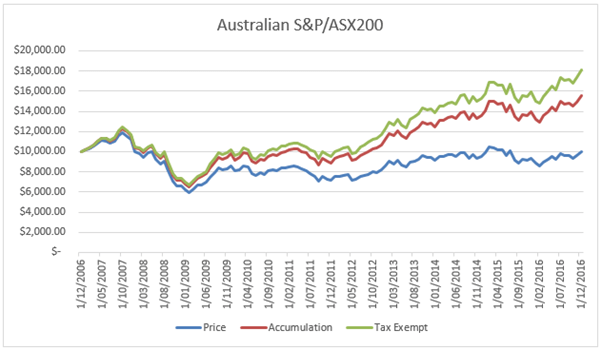 When dividend income is added, the Australian ASX/S&P200 has actually returned 4.5% p.a. over the 10 years to 31 December 2016. Not a great return, in our opinion, but certainly better than the capital growth suggests. The official overnight cash rate averaged 3.8% p.a., whilst the average 1 year term deposit interest rate averaged the same 4.5% p.a. as the dividend yield over the same 10-year period. However, the 4.5% p.a. term deposit income didn’t include franking credits, which the dividend income stream did. Australian pension phase superannuation investors get a full refund of franking credits, so franking credits represent extra income. Using the S&P/ASX 200 Franking Credit Adjusted Annual Total Return Index (Tax-Exempt), the total return for tax-exempt investors like pension-phase super, charities and low income Australian investors increased by 1.6% p.a., giving a tax exempt total return of 6.1% p.a., over the 10 years. 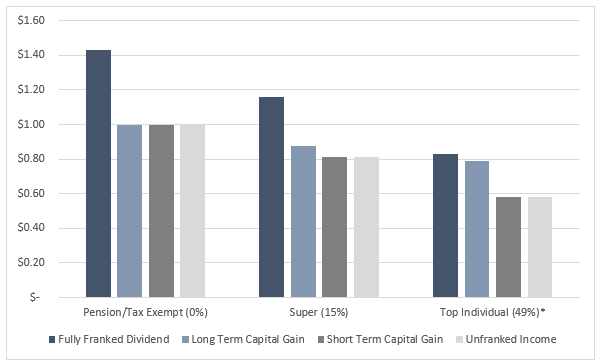 Chart 3 highlights the differences in index returns including franking for tax exempt investors. Dividend income and franking credits are an important part of the total return for share investments. For the 10 years to 31 December 2016, income has represented all the return from Australian S&P/ASX200 Index. Many investment products aren’t structured to distribute regular income, and in the current low interest rate environment we believe many traditional cash, bond or annuity based products are unlikely to be able to deliver the minimum 5% p.a. income stream that a 65-74 year-old retiree requires. Ultimately income has to be generated from underlying capital, so most pension-phase investors need to protect - and even grow - their nest egg. This total return focus is key to managing longevity risk and when done well, it’s why shares play an important role in retirement portfolios. Even as an income-focused investor, we believe in building portfolios that generate capital growth over longer time periods despite the subdued capital growth of the Australian market over the past decade. For instance since the start of 1980 to the end of December 2016 Australian shares have risen approximately 10 fold in capital value, with dividend income growth generally keeping pace with that capital growth. Shares enable both income and capital potential to be captured over the longer term. The last 12 months have presented a number of challenges for self-funded retirees. The government’s asset test changes have crimped part-pensions for many people in addition to the raft of new superannuation rules set to take effect on 1 July 2017. We estimate that a home-owning couple with $800,000 in other assets had (until 2017) received $567.15 per fortnight in part pension and we expect this will fall to just $47.70 per fortnight, a reduction of over $500 per fortnight or $13,500 per annum. Similarly a single home-owner part pensioner with $550,000 in assets will miss out completely on a part pension, losing some $365 per fortnight or nearly $10,000 per annum. What can pensioners do to offset the pension changes? The government suggested that part pensioners can make up for the loss of income by drawing down on their assets. For instance in the $800,000 couple example, the pension reduction can be offset by drawing down 1.7% of that $800,000 in assets each year. Thankfully Australian equities provide some of the strongest income opportunities available in the world today. For an Australian pension-phase investor who gets a full refund of franking credits, we’ve shown that the S&P/ASX200 yielded approximately 6% p.a. in income in the decade to end 2016, with about a quarter of this due to franking credits. But high yield Australian equities have potential to earn even higher rates of income. For instance, Australian banks currently yield around 8-10% p.a. on a grossed-up basis for franking. However, pension investors need to balance risk and return, and so putting all their eggs in the Australian banking sector may not be a wise strategy. Pensioners investing at least part of their assets in well-diversified equity products (both Australian and global) that produce the required returns should help preserve their capital base over a long-term investment horizon. 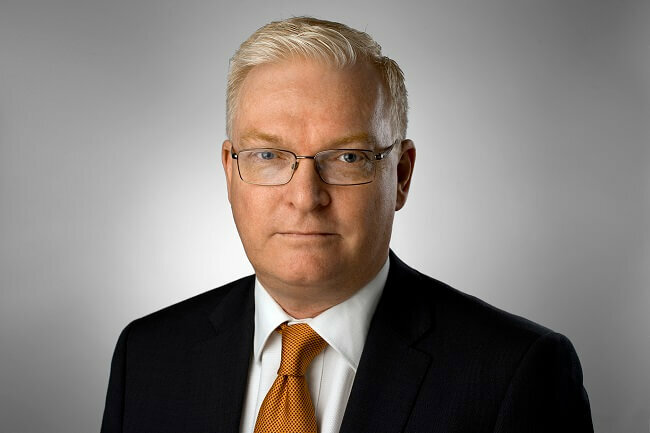 Dr Don Hamson is Managing Director at Plato Investment Management Limited. On 9 March 2017, Plato opened its first Listed Investment Company to Australian investors, Plato Income Maximiser Limited (ASX:PL8). The IPO offers SMSF and pension-phase investors the opportunity to invest in an actively managed, diversified portfolio of Australian shares with an income focus. To find out more visit Plato.com.au. Plato Investment Management Limited ABN 77 120 730 136 (‘Plato’) is a Corporate Authorised Representative (No. 304964) of Pinnacle Investment Management Limited ABN 66 109 659 109 AFSL 322140. Unauthorised use, copying, distribution, replication, posting, transmitting, publication, display, or reproduction in whole or in part of the information contained in this document is prohibited without obtaining prior written permission from Plato. Plato and their associates may have interests in financial products mentioned in the presentation.